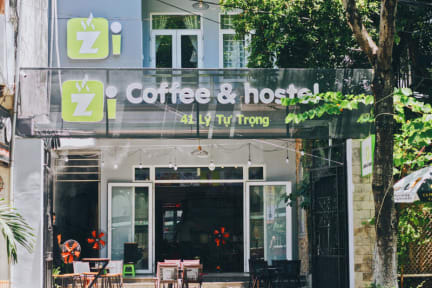 Located at the center of Danang city, Zi coffee & hostel features well decorated dormitory rooms and private rooms with Free Wifi. Each room has its own balcony with good view, bathroom with hot/cold shower and well-equipped with air conditioner. For dormitory rooms, guests can choose dorm for female or mixed dorm or group one. Individual lights, electrical sockets and personal lockers are provided for guests. For private rooms, the mini bar and cable TV are available for usage. Amazing hostel, best I've been in all year, clean and quiet. Other guests were polite and friendly. Location was good, plenty of coffee shops and a 15 min drive to the beach. Great little restaurant around the corner that served Vietnamese food too. To top it all off the staff were extremely friendly, help us out when ever we asked, helped us book tours and taxis/grab and even gave us tips and places to go on our onward travel. Newer hostel, upstairs from the coffee shop. Enjoyed our stay here. Everything was clean and the staff was really helpful. I was originally planning to stay for just two nights but then booked the wrong flight and had to come back. When I came back, the staff actually found me a bus ticket and drove me to the ticket office. So helpful and kind. The hostel was super clean and in a great area. Lockers to store your bags. Fresh towel and blanket and free tea. Thank you so much for your help! Great place! No breakfast but many cafes and bars nearby. Nice spot in Da Nang. The highlight of this stay was the sweet receptionist, Hiep. I was checking in late and she escorted me to a nearly full bunk room. After looking at all the backpacks and clothes cluttering the space, she shut the door and walked me across the hall. “You’ll be more comfortable in here.” She opened up an entire room just for me and I had my own space for the night. Winning customer service! Facilities were clean and adequate, nothing fancy but sufficient for my needs. Really nice place to stay. 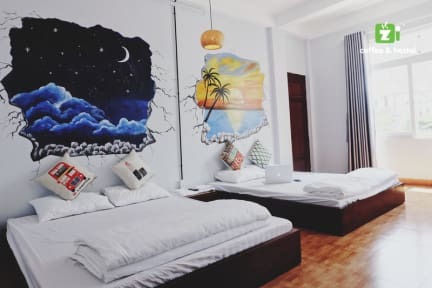 Very cute and affordable dorms and private rooms. Location is pretty good and you can easily walk your way through da nang from Zi. My boyfriend and I stayed for one night, and the staff was really welcoming and kind. The bed was hard and not clean. For one night it was okay, our room had the street in front, so it was quite noisy. Pro was the Pay-TV Access. Staff was very kind. The security at this hostel was very good and bedrooms and bathroom were very clean. Beds have privacy curtains. It was quiet when we were staying there so cannot comment on the atmosphere. However a massive THANK YOU to the staff at this hostel for getting my passport back to me when there was a mix up and I ended up in a new town with out it, I cannot thank the staff enough they were so helpful. Hostel above a coffee shop. Not much going on in the hostel and it is a few km from the beach and other sights. Rooms are comfy if a little bit dusty. Really good bathroom. Staff were great and sorted us a motorbike and booked us a taxi to the bus station when we left. Nice place, friendly people. Not that much open around but maybe we were there on a bad day... be aware that the ensuites are not ensuite. Otherwise great value, great place!